There has been an embarrassment of riches this year for anyone who is a fan of phenomenal acting on television. 2013 gave us more memorable, complex, and layered characters than ever before. And they were brought to life by men and women with a wide range of talents—actors who didn’t just make us think about these characters as we were watching them; they made us care about them long after the episode was over. For my next installment of NGN’s “Best of 2013” series, I want to take a look at the actors who brought something special to their respective television shows this year. In a year of standout performances, these—separated into male and female, comedic and dramatic—were the best of the best from my seat on the couch. This might be cheating a little bit because I’m just over halfway through the first season of Orphan Black, but I highly doubt the final four episodes I have left to watch will affect my opinion of Maslany beyond making me respect her even more. Not only does she impressively give each clone her own unique posture, accent, and mannerisms, she gives each one her own soul. I was expecting to marvel at Maslany’s talent when I started this show, but I wasn’t expecting to feel so deeply for so many of the characters she’s created. Yes, it’s amazing how she’s able to not only play clones but also clones pretending to be other clones. But what’s really amazing is the emotional commitment she gives to each character and each scene. Emma Swan is not an easy character to play. She suppresses her emotions after a lifetime of loneliness, only showing them in the subtlest change of expression until they all come out in bursts of vulnerability that surprise even her. Emma is strong, but she’s also incredibly broken. And it takes an actress of considerable talent and also considerable love for this kind of character in order to bring her to life successfully. Morrison is so adept at showing every complicated facet of Emma’s character—her awkwardness and her innate ability to lead; her fear of opening up and her intense vulnerability; her ability to love and her inability to fully accept love from others. Emma grounds this fantasy show in real, human drama, and Morrison grounds Emma with real, human emotions. There’s a reason the Red Wedding was one of the most heartbreaking television moments of 2013. Yes, it was horrifying to watch Robb Stark, his young wife, and his direwolf be brutally slaughtered. But the true pathos of that scene came not from Robb but from his mother. Fairley was fearless in her depiction of a mother’s desperation and grief. Her scream when Robb was murdered still haunts me, and her catatonic expression in the moments before her own death said it all: Catelyn Stark died the moment her son did. Only a truly great actress could communicate such depth without dialogue, and Fairley is as good as they come on a show filled with talent. Mellie Grant could be an easy character to hate—and I suppose, for some people, she is. But I love Mellie—I love her ambition, her ruthless edge, the steel in her spine, and the ferocity behind her first-lady façade. In Young’s capable hands, Mellie developed this year into a tragic figure beyond just a woman scorned. Drunk Mellie was brilliant, but it was Young’s work in the horrifying episode where Mellie was raped that floored me with just how talented she is at making us care about this woman beyond her role in Scandal’s screwed-up love story. More than any other actress on my list, Young is the one I wish more critics and award committees were taking notice of this year. Juliette Barnes is a complicated woman—she’s a woman from a trailer park who rose to country music stardom; she’s a woman who surrounds herself with men and yet has never really been in love; she’s a woman who’s been used and who uses others; and she’s a woman who acts every bit the diva but also has moments of astounding empathy and kindness. Panettiere has managed to give just the right amount of hard edges and soft spots to this character to keep audiences guessing about exactly who Juliette is. Whether she’s ranting about the way women are used in the music industry, befriending a young girl whose mother is in a coma, or breaking down after a confession of love goes awry, Panettiere has made Juliette feel like a real, complicated woman who it is impossible not to care for—no matter how selfish she may seem on the outside. No character arc on television in 2013 was more transformative than Jaime Lannister’s. He began as the character everyone loved to hate—the man who pushed a little boy out of a window in order to keep his incestuous relationship with his twin sister a secret. By the end of the Season Three, however, Jaime became the man who threw himself into a bear pit in order to protect Brienne; the man who promised to return Sansa Stark to her mother out of a sense of honor both he and the audience thought were lost forever. Such a complete turnaround in a character could have come off as unrealistic in the hands of a less capable actor, but Coster-Waldau made every step on Jaime’s long journey of character development feel believable. His confession to Brienne in the bath about the truth behind his Kingslayer moniker was one of those rare moments where the adaptation actually exceeded the source material in terms of its emotional impact. 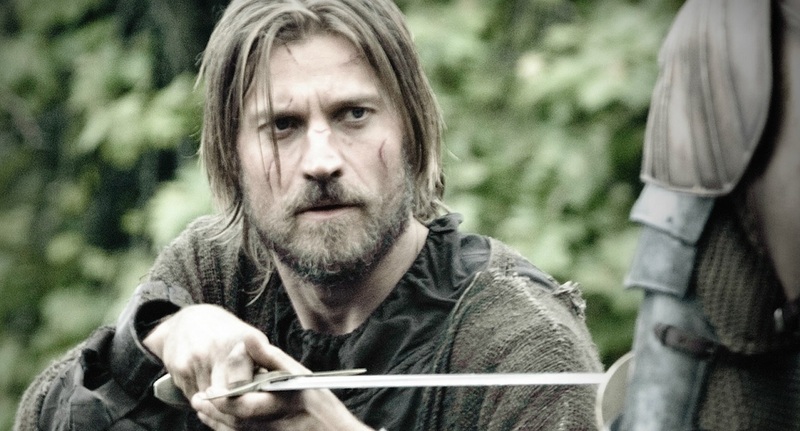 Coster-Waldau made you feel the immense emotional torture in Jaime’s soul, and, in doing so, he made certain that no one will ever see this character as a one-dimensional antagonist ever again. Like The Good Wife itself, the best word to describe Charles’s work in 2013 is fearless. The reveal of Alicia and Cary’s decision to start their own firm allowed Charles to take the reins off of Will Gardner with a startling intensity. His work in the much-hyped “Hitting the Fan” was incredible, but it was his imagined interrogation with Alicia in the show’s 100th episode, “The Decision Tree” that earned him a spot on this list. Fury, desire, pride, and vulnerability—Charles balanced all of these warring emotions in Will’s psyche with the dexterity of a true pro. If you would have told me before this year began that Once Upon a Time’s most irredeemable-yet-irresistible villain would be Peter Pan, I would have laughed. But I’m not laughing anymore. Instead, all I can do is thank the casting directors at Once Upon a Time for finding a young man in Kay who was able to make this beloved fairytale character the stuff psychological nightmares are made of. Kay played Pan as a twisted sociopath who we all hated and yet couldn’t get enough of. It takes a lot to go toe-to-toe with the likes of the great Robert Carlyle, but Kay matched him every step of the way in their scenes, proving that he has a bright future ahead of him no matter Pan’s fate in the Once Upon a Time universe. Sincerity will get you everywhere with me, and that’s what O’Donoghue brings to his work as Captain Hook. Just like I never would have believed Peter Pan would have been Once Upon a Time’s ultimate villain, I also never would have thought Hook would have developed into a romantic leading man to rival Prince Charming. But thanks in no small part to O’Donoghue’s incredibly sincere line readings and disarmingly expressive eyes, I completely believe the depth of Hook’s feelings for Emma and his desire to embrace his sense of honor once again after realizing that his quest for revenge left him empty. Hook has gone through a huge amount of character growth in 2013, and it has never felt forced to me because O’Donoghue has a true knack for showing the heart of Killian Jones that still beats underneath Hook’s pirate exterior. He also has true knack for creating chemistry with every actor he shares a scene with—from Jennifer Morrison and Rose McIver to Josh Dallas and Robbie Kay. I am always in awe of the subtle emotional reactions Fillion plays in all of his scenes on Castle. It’s those small details—the way his jaw clenches in a tense moment, the way he lowers his voice slightly when Castle is being completely serious, the way his eyes can go from sparkling to sadness in a moment—that elevate the whole show from a traditional procedural to something more emotionally fulfilling. And Fillion has never been better than in 2013’s Castle two-part episode, in which Castle’s daughter is kidnapped and he meets his father for this first time. Those two episodes allowed Fillion to display both an edge and an impressive emotional range he hasn’t shown since his Firefly days. The fact that this woman still does not have any kind of major award for this role is beyond ridiculous at this point. This year saw Leslie get married, travel to London, face a recall election, and ultimately lose her position on the Pawnee city council. In a year that featured so many changes, one thing that never changed was Leslie herself—her passion, her ability to love, her drive, and her enthusiasm. The way Poehler is able to make Leslie so funny and so nice at the same time is revolutionary in the best way—she proves with every episode that good people can be even funnier and more entertaining than bitter, petty people. And good people like Leslie can emotionally engage us in a way that more jaded main characters played with less warmth have never been able to accomplish. Not only is Deschanel a gifted physical comedienne with solid timing and delivery, she also has a real gift for emotional honesty. Her big eyes show a kind of vulnerability that’s rare to see on sitcoms, and that vulnerability helped sell every second of Jess’s strange but beautiful courtship with Nick. Deschanel took a character that began as the “quirky girl” and turned her into one of the most relatable women in TV comedy—a woman who can be both strong and feminine, zany and sensible. Deschanel appears as comfortable singing “In the Ghetto” in an Elvis suit as she does playing True American in her bra or opening her heart to Nick in a gorgeous sari. And that’s not something most actresses can say. Parks and Recreation is a show about good people who do good things for one another, and 2013 was the year April Ludgate really began to embody that mission statement in her own way. Yes, we always knew she cared about Andy, but this year, Plaza showed us that there’s plenty of room for Leslie and even Ann in her heart, too. In 2013, April sang “Time After Time” with Ann, took on a new professional role, supported Andy in his new job in London, and wrote what was quite possibly the most ringing endorsement of Leslie Knope’s virtues ever espoused on the show. And somehow, Plaza managed to make all of these good deeds—these emotional, warm moments— feel genuine for who we know April to be. She also still managed to balance those moments with April’s trademark sarcasm and dark sense of humor. I’m really looking forward to what 2014 has in store for this character and this actress after such a solid 2013. Rapid-fire dialogue, timely pop culture references, a self-deprecating sense of humor, and a way with physical comedy—Kaling brings all those things and more to her work as Dr. Mindy Lahiri. There’s always one moment in every episode of The Mindy Project where something Mindy says or does makes me cry from laughter, and there are more moments than I can count where she makes me nod my head with a kind of understanding born of finding a kindred spirit who just happens to be a TV character. This year, Mindy also showed a surprising emotional side, breaking my heart when she broke up with her fiancé and making me hold my breath with anticipation more than once when Mindy and Danny shared a moment. Retta makes every episode of Parks and Recreation better. No other show has a Donna Megale—she’s one-of-a-kind in the best possible way. Whether she’s talking about Scandal, explaining the appeal of the Dothraki on Game of Thrones, singing opera at Leslie and Ben’s wedding, or joining in on a “Time After Time” sing-along, Retta adds her own brand of cool to every scene she’s in. Nick Miller should be a one-dimensional character: an overgrown man-child, a terminal adolescent. But somewhere along the way, he became a character with more layers and facets than any other male character on a comedy show right now. A lot credit for that should go to Johnson, who showed us that Nick may act like a boy sometimes, but he is a man when it comes to loving Jess. Yes, Johnson is hilarious when Nick is panicked, drunk, or forced into a level of responsibility that scares him. But he’s also surprisingly adept at showing Nick’s emotional side, like his beautifully honest eulogy at his father’s funeral. Johnson has the most expressive eyes on TV, and he uses them to great effect. And let’s be honest, the man looks like he knows how to kiss a lady. Sitcom actors are not often the most subtle bunch of performers, but that seems to be Messina’s secret: He’s not your typical sitcom actor. Where other actors might have painted Danny Castellano with broad strokes, Messina created a neurotic old soul who is fleshed out in small details even more than in big moments. But when those big moments come, Messina sells the heck out of them, too. Running to Mindy’s hospital bedside, making the word “schmutz” romantic, and dancing like a boy band star are just some of the things he’s done to cement Danny’s status as one of the most romantic men on television, and it’s all because he makes every moment—even choreographed hip hop routines—feel true to who this character has become. 2013 will always be known for me as the year Ben Wyatt surpassed Jim Halpert as my TV Dream Man, and it’s all because of Scott. He made me cry with Ben’s vows to Leslie, he made me laugh when Ben was high on morphine, he made me smile when Ben talked about Game of Thrones, and he continually makes me wish for my own supportive, smart nerd who creates his own board games and shares his bachelor party with his friends. He may never get his own storylines, but Morris represents the very definition of making the most of what you’ve got. Johnson may be the heart of New Girl’s male ensemble, but Morris has become its funny bone. He can take the most ridiculous storylines and make them work, including Winston’s strange but wonderful relationship with his cat, Furguson. And I still laugh just thinking about his obsessive “puzzling” in Season Three’s premiere. 2013 brought us the calmer side of Chris Traeger while still allowing him to be the hyper-positive, hyperactive character we all fell in love with three seasons ago. Chris and Ben’s friendship finally got its own set of moments in the spotlight, and they were both adorably goofy (their “Butch Countsidy and the Sumdance Kid” handshake) and surprisingly emotional (Chris’s gift to Ben before his wedding). This year allowed Lowe to find a nice balance between the broader aspects of his character and the more grounded traits, such as his embracing of the responsibility of impending fatherhood with Ann. What were your favorite TV performances of 2013? This entry was posted in Television and tagged best of 2013, lists, television, year in review by Katie. Bookmark the permalink. This is a very very good list. You’ve made it hard to contradict many of the picks. A perfect example being your absolute astute take on Bellamy Young. As someone who has long lost interest in Scandal Bellamy Young was a highlight. That said – I am going to add in my trade offs. Olivia Coleman (Broadchurch) – Coleman’s performance is the very soul of Broadchurch and her portrayal of Ellie makes me weep for Anna Gunn and the FOX remake. For the finale alone she could make this list. But in fact it is her work and small moments in each episode that make her performance so stellar. Maggie Smith (Downton Abbey) – My love admiration and belief that she can do no wrong is longstanding. That said, while Maggie Smith has always been the singular best thing about Downton Abbey, her full talent was on display in Season 3. There isn’t an episode that I couldn’t pull a line or a scene out of that wasn’t simply a joy to watch. All but Colin from your list stay and I would swap him out for Timothy Olyphant who is creating one of the great characters on TV right now in Raylan Givens. We know I am in need of a handicap when it comes to comedies because I watch so few. However in shows that aren’t nearly as good as the actors who are the leads in them I would add Allison Janey (Mom) and Margo Martindale (The Millers). Broadchurch is an absolute must. And it is an easy marathon to do post Oprhan Black. I love Downton very much. It is also a very uneven show. The first season is wonderfully strong. The second for me dragged in spots and I (unlike many) really enjoyed season 3. Maggie Smith is worth the price of admission, but there are many characters to fall in love with on that show. Everything you said about Bellamy Young was PERFECT. She is so amazing as Mellie and there hasn’t been a scene with her that I haven’t enjoyed. Everything you said about Hayden makes me want to watch Nashville even more. I have such a soft spot for her because of Heroes and it makes me so happy that she’s doing such good work right now. I 100% agree with you on your choices for best male comedic performances. All 5 of them are amazing and have made me fall so in love with their characters. I really do feel like you can tell a lot about a person by their opinion of Mellie (and Bellamy Young by extension). The fact that you love her as much as I do makes me so happy. And I can’t say enough good things about Hayden’s work on Nashville, especially this season. The layers she has managed to give this character—who could be so one-dimensional—are astounding. Every week I love her character more, and it’s all because of the way Hayden brings her to life. Welp, I quit taking this seriously when you included Colin O. from Once. Not that I don’t think he could be a great actor but his lines are just so cheesy and he now serves no purpose in the show aside from being Emma’s love interest and following her around like a lost puppy. Boring. Thanks for taking the time to share your opinion, and I suppose we’ll just have to agree to disagree about Colin O’Donoghue’s work on Once Upon a Time. I do agree that his lines could be unbearably cheesy, but I think he gives them a sincerity that somehow makes them work and makes me believe them. I also think his character arc is about more than just being Emma’s love interest; it’s about him learning to fight for a noble cause again, to choose good instead of darkness. Yes, his love for Emma is a defining part of his character, but love has always been a motivating factor for him. I suppose the fact that we can have such different opinions makes watching and talking about shows like Once Upon a Time so interesting. Lana Parilla! With Save Henry and Going Home you need to have a heart of stone not to crumple to poeces with parilla’s acting. I totally agree with you about the emotional power of Lana Parrilla’s acting. If this would have been a Top Six, she definitely would have been my next choice. Her work in Going Home was absolutely incredible. I absolutely love Lana Parrilla, and I agree that she’s incredibly talented. Choosing the most talented cast member on OUaT for me is like choosing a favorite child (if I had kids). Everyone is so good at what they do. I just feel Jennifer Morrison is so underrated for her great work (and Emma is a personal favorite of mine), so I felt the need to show her some love here. That doesn’t mean I don’t think Parrilla isn’t also a brilliant actress. I havent posted on many of your best of lists because having to pick “top 5” or “top 10” anything leaves me paralyzed with indecision. I give you props for being decisive enough to pick favorites and brave enough to share them! I just wanted to say that I totally back your inclusion of Jen and Colin on these lists. They are two actors that are not going to ever be nominated for any awards for their work on Once, or even be on any professional TV critic’s best lists, but for me they deserve the recognition. I consider a ‘great performance’ to be one where you know the show would suffer majorly without those characters and you couldn’t imagine anyone else playing them better. If you told me at the end of 2012 that a year from then ‘Once Upon a Time’ was going to be my favorite show on TV, I never would have believed you. But it has become the show I wait impatiently all Sunday for, and its all because of the character development of Hook and Emma and Jen and Colin’s performances. Hook as a character didnt really click for me until the Season 2 finale when they explored his history with Bae (and Colin was able to to show the sincere side of Hook), but I have only grown to love his character more from that episode on. And the vulnerability and growth that Emma has been able to explore (and Jen has so beautifully portrayed) in second half of season 2 and the first half of season three has me rooting for her more than ever. Put the two of them together and you have a relationship I can 100% root for. I know these two already exist on your “favorite relationships” list, but really, the relationship wouldn’t be as great as it is without the performances of Jen and Colin. As Ive said before, I am pretty sure the two seconds of them just looking at each other in the season finale as they say goodbye is some of the most convincing acting I have ever seen. Thank you so much for the comment, Shauna, and I think this is the first time in my life I’ve ever been called “decisive”! 😉 It took me forever to make these picks, and I changed them all so many times before settling on the lists I made. Your thoughts on Hook and Emma—and Colin and Jennifer’s excellent acting—are stated beautifully. I especially love what you said about Colin’s sincerity in the Season Two finale really making you start to like Hook, because that’s when it all clicked for me, too. I think both Jennifer Morrison and Colin O’Donoghue had really nothing to work with particularly this last season. Once is a show that have been progressively declining in narrative, scripts and dialogue quality. And now we only got the flashes of good acting in some of the best cast members (like Carlyle, Parrilla and sometimes Goodwin) in the very over the top dramatic scenes. Morrison has never struck me as a good actress and writers continue placing Emma Swan in a bizarre romantic triangle and always angry just because, at this point we only have the remains of what could have been a character with so much emotional depth but we barely even know her and O’Donoghue was truly just a sappy romantic interest all through season 3. Also Parks and Recreation that’s a show that needs a lot more love from people, an incredible cast! First of all, thank you for taking the time to share your opinions on two of my favorite shows. 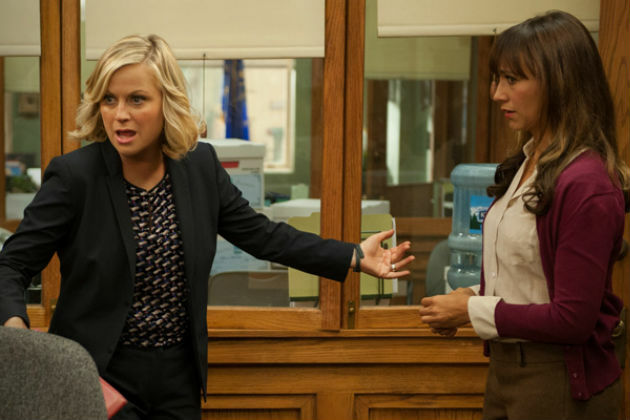 I totally agree with you about Parks and Rec—it deserves so much love! As far as Morrison and O’Donoghue are concerned, I suppose we’ll have to agree to disagree because I still think both actors turned in very strong performances throughout Season Three. I’m a member of the camp of fans who believes the show vastly improved in quality from Season Two to Season Three—and these two actors played a large role in that improvement from my perspective. I admire Morrison’s work as an actress because I think she has always allowed us to see that Emma is never angry for no reason; she’s struggling with a lifetime of believing her wishes and emotions don’t matter, so it’s hard for her to express those emotions. To some that might come off as bad or stilted acting, but I believe she’s always allowed us to see the depth behind Emma’s walls, especially in this past season. And I think O’Donoghue’s talent is what propels Hook from being a “sappy love interest” or one-note villain into being a character whose complexity and sincerity caught me off guard in a very good way.